At RiverCraft, we create furniture for commercial and residential use, working with interior designers, businesses, and individuals. Our work includes individual pieces and sets. We use the finest materials and favor beautiful live edge and salvaged wood with plenty of character. We believe that custom furniture reflects individual personalties and can address design challenges far better than commercial alternatives. Our furniture is built to order in our workshop in Silver Spring, MD. Each piece is made in-house, ensuring the highest workmanship and attention to detail. We design the pieces according to our client's preferences or project specifications. In some cases we create 3D renderings to help clients visualize the finished piece. We work along with our clients to select the materials that will most enhance the beauty and function of all pieces. In all cases, we make sure our furniture will stand up to the wear and tear of daily use. Jeff Sutton's love of woodworking started while renovating a centuries-old farmhouse in France during his college years. As they reconstructed historic structures held together by only wooden pegs, he marveled at the craftsmanship and engineering that held them in place for hundreds of years. 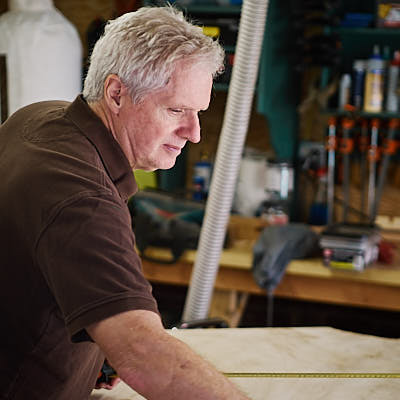 A few years later, he apprenticed as a furniture maker, learning the secrets of the craft from experienced woodworkers. Jeff's career later led him to pursue architectural 3D modeling for product design, photography, and construction, all skills that have served him well in their application to the craft. Jessica Arends is an educator and woodworking enthusiast. 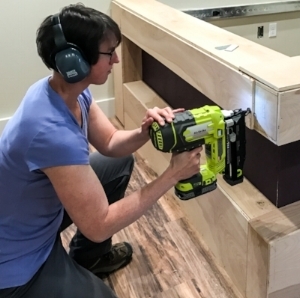 Since taking carpentry classes two years ago, she has worked at River Craft on such projects as customized desks, shelving, outdoor structures and her own mobile chicken coop. She regularly volunteers for Habitat for Humanity. Much of the work happens under Loui's watchful eye.